A generation removed from Saved By the Bell, former teen heartthrob Mark-Paul Gosselaar, now 44, is acting with kids again. Actually, it’s just one kid. But what a kid. 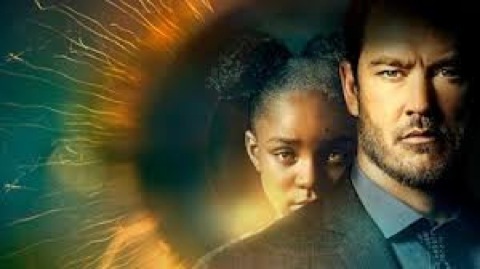 Saniyya Sidney is terrifically appealing in Fox’s The Passage, with Gosselaar’s character both soothing and cajoling her in a Big Four broadcast network scripted drama series that’s accomplished a seeming mission: impossible these days. It’s left me wanting more after watching the three episodes made available for review. Ever since The X-Files (which had two latter day reincarnations), Fox has striven to launch another long-distance runner from the sci-fi/supernatural genre. Fringe and Sleepy Hollow kept those fires burning for a few seasons, although it’s hard to imagine any reboots of either. But the likes of Terra Nova, Wayward Pines, Dollhouse, Almost Human, Alcatraz, Dark Angel, Terminator: The Sarah Connor Chronicles, Millennium, John Doe, Harsh Realm, Night Visions and The Visitor all ended up flaming out quickly. Gosselaar likewise has been around the block more than a few times, establishing himself as something of a latter day Robert Urich in terms of starring roles in one TV series after another. Last seen in Fox’s short-lived 2016 Pitch as a veteran major league catcher, Gosselaar has matured into a seasoned adult actor with a sturdy presence. In The Passage, he plays federal agent Brad Wolgast, a divorced war veteran with 98 kills under his belt. Back in the civilian world, his new job is talking prisoners on death row into being guinea pigs in lieu of being executed. Twelve of them have been lured to Project Noah, a secret experimental project based in Telluride, Colorado. The scientists within are racing to develop a drug that would make humanoids immune from all diseases. Time’s not on their side, because a lethal Asian flu pandemic is scheduled to hit the U.S. in just 60 days. So far, though, the guinea pigs have all become blood-drinking, mind-invading inhumans in one form or another. Gosselaar’s character is unaware of this when he’s told to fetch wayward 10-year-old Amy Bellafonte (Sidney), a kid that “no one will miss” after her drug addicted mother dies of an overdose. The latest theory within the walls of Project Noah is that pre-teens have a “greater neural concentration and plasticity” that may yield better results in developing a catch-all vaccine. Got all that? Whatever the sci-fi parameters, they’re not enough in themselves to sell a series. That’s where the relationship between Brad and Amy comes in. Blaming himself for the loss of his daughter, he’s at first taken aback and then taken in by the kid’s pluck. So they’re soon on the lam, nurturing each other in their own ways. That all sounds pretty prototypical. But thanks to Gosselaar and Sidney, the first three episodes of The Passage are filled with little moments that make it all seem new again. The Passenger also utilizes flashbacks to flesh out both the guinea pigs’ and scientists’ back stories. One of the other principal cast members, Henry Ian Cusick, already knows this drill. The former Lost mainstay, as Desmond Hume, is back for another sci-fi go of it as Dr. Jonas Lear. He knows where the figurative bodies are buried after persuading a fellow doctor, Tim Fanning (Jamie McShane), to embark on a 2015 expedition to Bolivia in hopes of finding a miracle cure for Lear’s Alzheimer’s-inflicted wife. Alas, things went very wrong there for Dr. Tim. Also within the Project Noah confines are featured death row parolees Shauna Babcock (Brianne Howey) and Anthony Carter (McKinley Belcher III), the latter newly arrived. Lear’s colleagues include the relentless but growingly spooked Clark Richards (Vincent Piazza) and his romantic interest, Dr. Nichole Sykes (Caroline Chikezie). She seems to mean well but it’s likely too early to tell. Wolgast’s still supportive ex-wife, Lila Kyle (Emmanuelle Chriqui), likewise a doctor, tries to intercede from the outside. Early in the first episode, Amy’s narrative voice doesn’t leave out much hope. “This is how the world ends,” she pronounces. It’s Fox’s hope that there’s plenty of time for that -- perhaps five or six seasons at a minimum. To that particular end, there’s been no lack of on-air promotion for The Passage, which shows considerable promise in these early episodes. Thanks to Gosselaar and Sidney, the all-important human element goes hand-in-hand with all the sci-fi ins and outs.